When a teenage girl (Ashley Rickards) sells her soul for $500, she doesn’t realise the impact that it’s going to have on her life; or on the lives of two sisters, Leigh (Catalina Sandino Morena) and Vera (Naya Rivera). 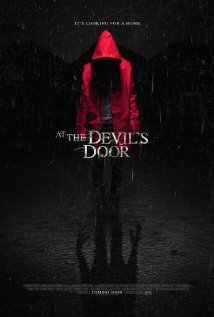 While the disjointed narrative style of At the Devil’s Door takes a bit of getting used to, it ultimately manages to break up the movie’s story in an engaging way. You get fed bits of information a piece at a time, and can never be entirely sure where things are going to go next. The movie also manages to build up a good amount of tension in its first act. It isn’t quite able to maintain this same level throughout, but a spattering of jump scares manages to reinforce a general sense of unease that permeates the movie. It felt like something could happen at any time; and, while there were some predictable scares, there were also some unpredictable ones. Unfortunately, the more that I think about the story after the fact, the more major plot holes there seem to be. To the point where I wish that they’d tried being less fancy with the editing, so they had more time to spend on making sure that the story actually made sense. The characters are also largely without any depth, which makes their actions – particularly in the final act of the movie – pretty senseless. It’s clear that no thought has been put into why these actions would be taken; either because there was an assumption that the viewer would fill in the blanks, or because they just didn’t care enough to put that much thought into it. Really, the more I think about it, the more disappointed I am in At the Devil’s Door. It could have been a good movie, but there seems to have been too much focus on the surface – and not enough on those elements that actually make a movie good.